A couple of students requested a “fun” math problem. 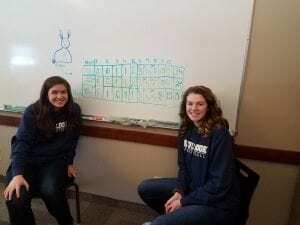 They explored a scenario of “multiplying” rabbits where the solution ended up being the Fibonacci sequence. After a few failed attempts, a table proved to be an efficient way to keep track of the different aspects of the problem and allow the students to arrive at the correct solution. They certainly looked like they had fun! Hello! I was born and raised in Montana. My wife and I met attending college at MSU Bozeman. After moving to Denver for a couple years, we missed Montana so much we decided to move back. We discovered Red Lodge and can't believe it has already been three years!